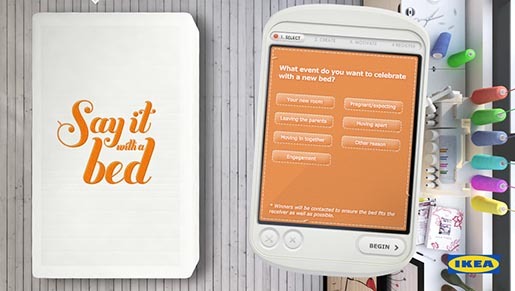 IKEA is Sweden is running “Say it with a bed” (Säg det med en säng), a campaign giving customers the opportunity to embroider their own bed and give it to someone who’s taking a new step in life. Over eight weeks IKEA is choosing eight winners who get their messages embroidered on an IKEA mattress. 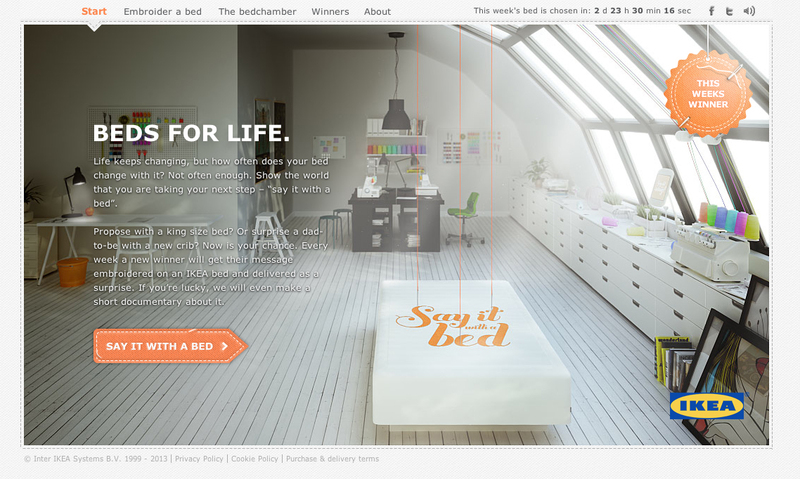 Entrants compete by digitally embroidering a message on a bed and telling IKEA why they deserve to win. The winning beds are delivered as a surprise to their chosen recipient. In some cases the stories are documented in short films, as in the case of the first winner, My. The campaign is online at sagdetmedensang.se, and in English at IKEA.se/sayitwithabed. The Say it with a bed campaign was developed at Akestam Holst by creative director Andreas Ullenius, copywriters Viktor Jacobsson and Maja Folgero, art directors Andreas Ekelund and Petra Albrektson, digital producer Alex Picha, planner Mikael Grenros, account director Kjell Månsson and account manager Anna Nolendorfs. Digital work was done at B-Reel.